HRW says instead of just sticking Muslim Rohingya in lockups, country's ruling junta should provide them with safety, protection. 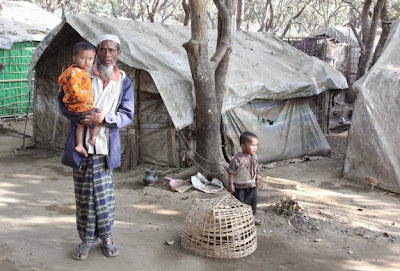 BANGKOK -- International organizations are attempting to pressure the Thai government into authorizing an independent investigation with United Nations assistance into the discovery of what are suspected to be mass Rohingya graves at a human trafficking camp in southern Thailand. The ruling junta has said it has made the fight against trafficking a top priority after the country was downgraded to the lowest level in a U.S. State Department Trafficking in Persons report in June last year. But organizations such as Human Rights Watch say local officials remain complicit. “The finding of a mass grave at a trafficking camp sadly comes as little surprise," Brad Adams, Human Rights Watch director for Asia, said in a statement Saturday. Thai police and rescue workers, alerted by a villager, discovered Friday an abandoned human trafficking camp located in Sadao district of Songkla province, just 300 meters north of the Malaysian border. Sathit Kamsuwan, of the Maikom Sadao municipal rescue service, told the Phuketwan website that "about 200 Army, police and rescue workers had to climb on foot for 50 minutes up the hill into the jungle" to get to the camp. Police Chief Somyot Pumpanmuang described the area as a "virtual prison camp," where migrants were held in bamboo cages. At least 32 graves have been found, and a forensic team has begun to exhume the bodies. Pumpanmuang told reporters in Bangkok that there could be 20 more graves in the area. "They will have to carry the bodies out because ambulances can't cross the terrain. We have counted 32 grave sites, plus one body above the ground so far. There is one survivor," Kamsuwan said. The survivor - from Bangladesh; starved and exhausted - is believed to have been left to die when the traffickers fled. Phuketwan reported that his muscles were severely wasted and he has been taken to a hospital for treatment. Investigators have said that they think 200 to 300 ethnic Rohingya Muslim from Myanmar and Bangladesh were kept as prisoners in the camp by human traffickers, waiting for their families to pay ransoms before letting them cross the border to Malaysia. The traffickers are reported to have apparently left the camp during the week with the surviving Rohingya. Rohingya -- fleeing persecution in Myanmar – are frequently forced to pay smugglers large amounts of money to take them on rickety boats to the Thai coast. Once there, they frequently fall victim to more gangs who force them to stay in hidden jungle camps until their families back home pay ransoms. “This discovery should shock the Thai government into shutting down the trafficking networks that enrich officials but prey on extremely vulnerable people,” added Adams. “Instead of sticking Rohingya in border camps or immigration lockups, the government should provide safety and protection." As of mid-day Saturday, there had been no official reaction to the mass graves from the Thai junta.